(From Olympus lens literature) This high-end, high-performance telephoto lens possesses a fast f/2 aperture for shooting beautiful low light pictures or impressively capturing subjects with the background out of focus. Four (4) ED glass lenses and one (1) super ED glass lens produce superior optical clarity and contrast from one-edge of the image to the other. This all-digital lens features a built-in CPU that directly communicates with the camera's software for exceptional control and accuracy, and also stands up to the elements with all-metal components and rubber seals to protect against moisture and dust so you can use it practically anywhere. â¢ Extremely sharp, corner-to-corner, at all focal lengths and apertures! â¢ The world's FIRST Æ/2 lens! â¢ Superb build quality. I call this my "bag of primes." Yea, it's big and heavy, but how big and heavy would it be to pack a 35/2, 50/2, 75/2, 100/2, and a 141/2.8 (with the superb E-14 teleconverter). It's my go-to lens for events. I shot a conference with it, and the reach range was perfect for classroom settings. Adding the E-14 telecon made it very useful for dimly-lit auditorium shots. It is also perfect for live music and theatre, where you really need the /2 light gathering! I got my used, near-mint copy from BorrowLenses.com, whom I heartily endorse. I don't (yet) own an Olympus E-M1, but the manufacturer was evidently hoping to keep its faithful old Four Thirds customers happy with a camera that finally enabled some absolutely fantastic lenses to perform almost as well as they did on the platform they were originally built for. My understanding is that the E-M1 falls slightly short of the mark, because none of its focus sensors are cross-hatched and that's bound to inhibit the powers of the lenses, which rely on a phase detect autofocus system to operate properly when subjects are moving. I find it personally quite sad that this particular lens, billed as the world's first digital zoom with an f2 aperture, is more of a minority item than ever and it deserves a better fate than that. You won't find new online reviews of it by the popular and trusted sites because the Four Thirds system is dead. In my opinion, based on a satisfying experience of shooting with four of its finest lenses, these are amongst the best digital lenses ever made by any manufacturer. Other reviewers have pointed out that Olympus 'High Grade' lenses are uniformly excellent at the very least. I consider the 50mm f2 macro to be superb, incidentally. However, I agree that this 'Super High Grade' specimen is on a different level altogether to either the ZD 11-22mm f2.8-3.5 or 14-54mm f2.8-3.5 zooms respectively. The build quality is absolutely top class and better than I really need it to be. It's also faster than I personally need it to be, but even wide open on the odd occasion I've tried it that way, the results are wonderful. What stands out is that there is very little discernable difference between the edges and corners of the frame and the very centre. A rare achievement indeed to produce results as outstanding as this throughout the zoom range. My own solitary Four Thirds camera is an E-3, which produces 10 megapixel images. This does scant justice to the resolving powers of the lens and I find it difficult to see that 12 megapixels would be much of an improvement. Possibly the E-5 focuses faster than the E-3 and if it does, then that would be a reason to choose one camera over the other. I have yet to see 16 megapixel images taken with the lens by a micro four thirds camera and I would very much like to take some pictures of my own at that resolution or preferably higher. But aside from the focusing considerations, the strong impression I have is that the lens would be far too front heavy and generally badly balanced on the E-M1, unless you added a battery grip to it. Returning to the qualities of the lens, I must admit that it's the nearest to being a perfect model of all the many I've used by various manufacturers. Chromatic aberrations and distortion are not apparent at all and there is no vignetting on any of the pictures I've imported to Lightroom so far. My understanding is that results against bright light sources are not too impressive, but my photography doesn't really involve backlighting very often, so I can offer no guidance here. I would not recommend this lens to micro four thirds users at the present time because Olympus has produced a new lens that is far more suited to the native system. My hope is that the successor to the E-M1 has an enhanced phase detect autofocus system build into it. No doubt both Olympus and Panasonic will continue to produce cameras that resemble DSLRs, and phase detect autofocus probably offers the best route towards mirrorless cameras offering genuine opposition to DSLRs when it comes to photographing wildlife and fast-moving sports. Unfortunately for me, my ZD 35-100mm f2 lens is far too good for my present camera and to some degree wasted on me. But I enjoy the results from it very much and I'm sure you would too. Postscript: My overall rating has been downgraded by one point after an unsatisfactory morning's photography at a show jumping event. The lens was mounted on my E-3 and at mostly large apertures it failed on the majority of occasions to pick out moving horses or riders and tended to choose static vertical structures instead. Continuous autofocus was a complete let-down and selecting a narrower range of focal points not a viable option, given that I did not normally want my critical focus to be in the centre of the frame. Very disappointing. As a former owner of the Sony 70-200G SSM mounted on the A850, this is the system I can compare this lense here. FOV is equivalent to the 70-200G. I haven't really noticed any drawback in comparision to the SSM of Sony or the 50-200SWD which I own. The AF is fast and accurate. 9 out of 10 shots are perfect. Tele Converters are excellent. 1.4x and 2.0x can be used. 70-200 (140-400) with f4 is certainly a an excellent match. 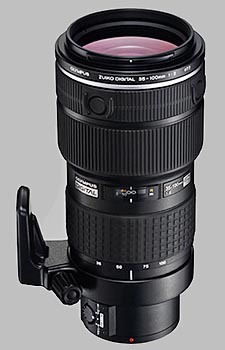 Without any doubt I can say that this is the lens which will replace my 50-200SWD and team up with my 14-35 SWD. 1. The 35-100F2 is razor sharp even at F2. I'm shocked by the detail and sharpness thats the lens shows. 2. Lens is sharp edge to edge even wide open. There is no CA either. 3. Noise and detail with the 35-100F2 even at the same ISO are much better than the 14-54ZD. You can instantly tell which file was taken with the 35-100 whether using the E1 or E3. 5. DOF - shallow DOF at F2 is creamy smooth but also very thin. Its a cracker of a portrait lens. 6. Low light shooting - being able to shoot at F2 constant is seriously welcome. IQ using the lens on either an E1 or E3 is something else and has to be seen to be believed. The lens is tack sharp wide open and edge to edge. It displays no CA/FP at all, so Oly have done an excellent job here. The pictures speak for themselves. Its my main lens esp for studio work as its perfect for portraits/fashion/beauty shoots and its got me thinking about the 14-35F2 as well. The 35-100F2 is a big beastie and if it were just a couple of 100lbs lighter, an inch or two shorter, and a wee bit cheaper in Europe (I paid just under 1500 GBP) it would be Perfect. If you can get one you won't regret it.